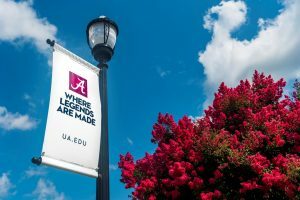 UA set a fundraising record for gifts and pledges received during the recently completed fiscal year. TUSCALOOSA, Ala. — The University of Alabama set another fundraising record for gifts and pledges received, raising $224.3 million during the fiscal year that concluded Sept. 30 from more than 62,300 donors during 2017-18. The University shattered the previous record by almost $104 million, representing an increase in giving of approximately 86 percent. The 2017-18 fiscal year, which began Oct. 1, 2017, made history with cornerstone gifts from Hugh F. Culverhouse Jr. and UA alumni Marillyn and James Hewson. The University of Alabama School of Law announced in September a $25 million gift commitment from Culverhouse, a prominent business executive and attorney. To honor Culverhouse’s impact and generosity, the UA School of Law now bears his name as the Hugh F. Culverhouse Jr. School of Law at The University of Alabama. The naming recognizes the $25 million gift, the largest gift commitment in the University’s 187-year history, as well as a $1.5 million gift made in 2017 to establish the Hugh F. Culverhouse Jr. Endowed Chair in Constitutional Law, which serves as a foundation for an expanded program in Constitutional studies. Announced in July, a $15 million gift from the Hewsons supports the next stage of growth at the Culverhouse College of Business, which is where Marillyn earned a bachelor’s degree in business administration and a master’s in economics. James is also a graduate of the University, having earned a bachelor’s degree in communications. In September, the Culverhouse College of Business announced a $30 million fundraising campaign for the construction of a new building to be named Hewson Hall in recognition of the campaign’s lead gift from the Hewsons, which is the largest one-time gift in the history of the University. The fiscal year also saw the launch of The Crimson Standard in August. Announced by The University of Alabama Department of Athletics, The Crimson Standard is a 10-year, $600 million capital initiative designed to improve UA Athletic facilities and comprehensively elevate the student-athlete experience, recruiting efforts and the overall game-day experience for all Crimson Tide fans. The fundraising success of UA Athletics contributed greatly to the $224.3 million record. The historic year breaks the previous record of $120.7 million, which was set just last year. Donors provided almost $32 million for scholarships, $99 million in faculty and program support and more than $93 million for building projects. The total includes deferred gifts and athletic gifts given since Jan. 1, 2018, reported at 100 percent face value. The year also introduced the inaugural Bama Blitz, UA’s first day-of-giving fundraising campaign, which raised more than $1.8 million for projects in all of the University’s academic units and provided alumni, parents and donors with a new way to support the Capstone. “The greatest success of Bama Blitz is the students who will be impacted through the incredible amount of donations from the UA family,” said Mary Lawhorn, director of annual giving. The Crimson Standard fundraising initiative, ongoing efforts to raise $15 million for a new Performing Arts Academic Center and $2.1 million for the Blackburn Institute, and other charitable giving initiatives, are helping set the stage for an eventful 2018-19 fiscal year. “I believe we are in the early stages of an era of incredible growth in charitable giving at the Capstone, and we encourage all UA alumni to participate,” said Pierce. “We are obviously thrilled and grateful for the transformative gifts made to the Law School by Hugh Culverhouse and to the Culverhouse College of Business by Marillyn and James Hewson. However, we are also excited by the sheer number of donors this past year.